Please complete the following online form. Once completed, we will have all the needed documents for the Brokerage, DBPR, Real Estate Board and the IRS. If you would rather use a printable copy to email, drop off or fax in, please click here. All information submitted on this website is secure. Please remember to attach a copy of you Florida Real Estate License to complete your enrollment. If You Prefer, You Can Download A PDF To Print Out And Submit By Clicking Here. Please enter exactly how you would like information to appear on your business cards and signs being ordered. Remember, this is how it appears on the DBPR Website and your license. All Agents are provided a lead capture website. Your website address will be "FIRSTNAME".HamiltonFranklinRealty.com. If you prefer you can enter a website domain you currently own and we can forward your company website address to it. All Agents are provided a company email address. 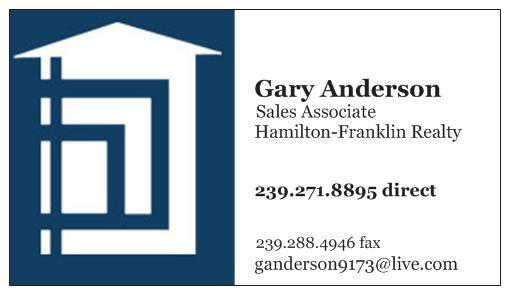 Your email address will be "FirstName"@HamiltonFranklinRealty.com. Any emails sent to this address will be automatically forwarded to your personal email address listed above. Please select what email you would like printed on your business cards. 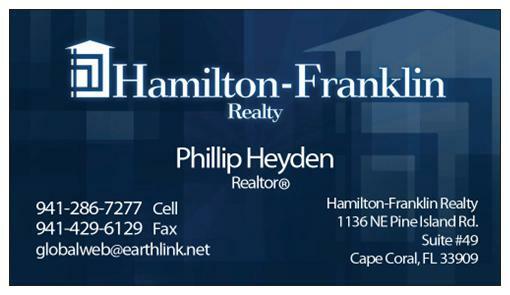 FirstName@HamiltonFranklinRealty.com Please Use The Email Address Listed Above "Primary Email"
Please choose your business card design from the options below. The following is to set up your Direct Deposit Account with Chase Bank. This information is not mandatory and you can submit a paper form with this information at a later date if you wish to enroll in our free direct deposit service. 1) TO ALLOW HAMILTON-FRANKLIN REALTY TO ACTIVATE YOUR FLORIDA REAL ESTATE LICENSE. 3) To join the greater fort myers real estate board within 30 days of license activation. 4) Supply hamilton-franklin realty a copy of your florida real estate license within 24 hours. By typing my name in the box below, i understand that it is considered as legally sufficient as a real signature and acknowledge/agree to the terms above.